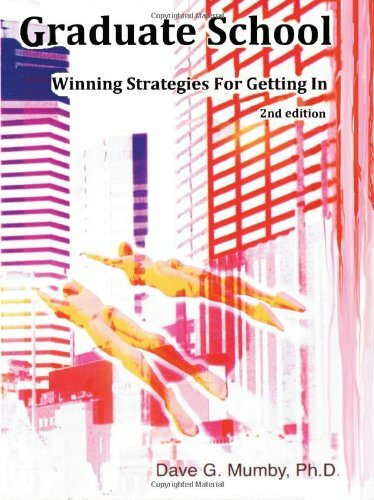 Graduate School: Winning Strategies For Getting In provides college and University students with all the information and advice they need to apply successfully to graduate school. Several misconceptions about graduate school are revealed and dispelled, including the most common myth that one must have excellent grades to get in, and that excellent grades are all that one needs. Certain factors that can play an even bigger role than GPA in determining the fate of an application are discussed, and the reader discovers how the process of selecting applicants actually works in most graduate programs; it is not the way that most people think! Students with outstanding grades will discover why they need more than just their grades to get into grad school and succeed once there. These other requirements are explained, along with numerous tips and suggestions for making sure that one has it all when it comes time to apply. "The application process seems too daunting, so you've decided to forego the opportunity to attend grad school, and roll the dice in the job market. Don't settle for that entry level job just yet; there's a book you should read before you make up your mind about postgraduate education." -- Devin McGinty "Grad Share: Graduate Student Community"
Dave Mumby received his Ph.D. in 1992. He has been a faculty member in the Department of Psychology at Concordia University since 1994, and has supervised many undergraduates and graduate students during his career. He is also an academic advisor and frequent contributor of original advice columns for MyGraduateschool.com, the companion resource website for this book and the myGradSchool blog.